Left to right: Guy Ashmore, Laura Kington and Rachel Metzler with freshly picked turnips at That Guy’s Family Farm. Rachel Metzler (left) and Laura Kington (right) helping Guy Ashmore construct a high tunnel at That Guy’s Family Farm. Nellie Ashmore (left) and Chelsea Gorman (right) of That Girl’s Flowers pulling flowers out of a high tunnel. CLARKSVILLE — In October, 4,000 pounds of sweet potatoes came out of the ground at That Guy’s Family Farm. Around the same time, about 150 chickens left the farm. Guy and Sandy Ashmore have harvested most of their winter storage crops, but they will continue to harvest possibly through December. Still to harvest they have Irish potatoes, cabbage, carrots, turnips, celery, kale, watermelon radishes, kohlrabi and other fall crops. The last crop planted this fall was garlic, along with cover crops at the end of October. The cover crops were mostly rye. The Ashmores said they were happy with the yield of sweet potatoes and butternut squash, of which they harvested 2,000 pounds. They are also tilling about 6 acres of land that hasn’t been tilled in 18 years, which will allow for more long-term rotations on other plots of the farm. They will plant on this land next year. Guy and Sandy’s daughter, Nellie of That Girl’s Flowers, has been busy with floral weddings this October. She is also growing mums that can be cut and put into vases, instead of potted mums. Their son, Connard, is in the process of preparing to farm about 14 acres of land at a neighbor’s farm about a mile from the family farm. “He’s trying to decide what might best fit him and that piece of property,” said Guy. Connard will operate the land as certified organic and will begin farming in the spring. He has worked for the owner of the land for a while. “It will complement our business really well because it would open up some acreage here to do longer term crops or rotation,” said Guy. Connard has also been raising pigs on the farm, four of which went to the processor in October. That Farm and Flower Store will close for the winter at the end of October and reopen in May 2019. The store is a small refrigerated building at the front their property with fresh cut flowers and perishable produce for sale. People can stop and purchase through a self-serve honor system. The Ashmores kicked off their Winter CSA (Community Supported Agriculture) in the beginning of November. They are looking to have up to 50 members and were about halfway there in the middle of October. Last year they had about 40 members. The Ashmores also had to fulfill their yearly organic recertification inspection in October. The inspector usually spends half a day at their farm, auditing the land, equipment, records and other documents. Guy and Sandy have to fill out an application every year before the inspection, which goes through The Ohio Ecological Food and Farm Association (OEFFA). They usually start to fill that out in February or March. On Nov. 2 the summer apprenticeship program ended and Rachel Metzler and Laura Kington left That Guy’s Family Farm. They were there for six months total. Metzler and Kington apprenticed at the Ashmore family farm through the OEFFA Begin Farming Program. Metzler said she had enjoyed the experience and wants to obtain other experiences to compare and help her focus on what she wants to do in the future. Her experience with the Ashmores opened up more questions for her to pursue, including her experience with animals. “[The Ashmores] have a variety of income models — the CSA, wholesale, farmers market. That’s been amazing. It’s hard to get that all three of those in one farm experience,” said Metzler. Guy and Sandy said that having apprentices and teaching them helps them consider their own processes. In October, Kington and Metzler, along with two friends, participated in the process of butchering 150 chickens at the Ashmore farm. They also visited another farm, where they helped a woman butcher chickens, but on a smaller scale with 19 chickens. Metzler found the anatomy of the bird fascinating, which she said she didn’t expect. The butchering process for 150 chickens took about 4 hours and bagging them took about 1 hour. They didn’t have to prepare them for resale. The birds were bigger than usual, according to Sandy, who said they averaged 6 pounds this year. The Ashmores said that the process went smoothly. Every year Guy and Sandy raise 150 chickens for themselves and their family, and they always have the apprentices help. Next month: Winter community supported agriculture. 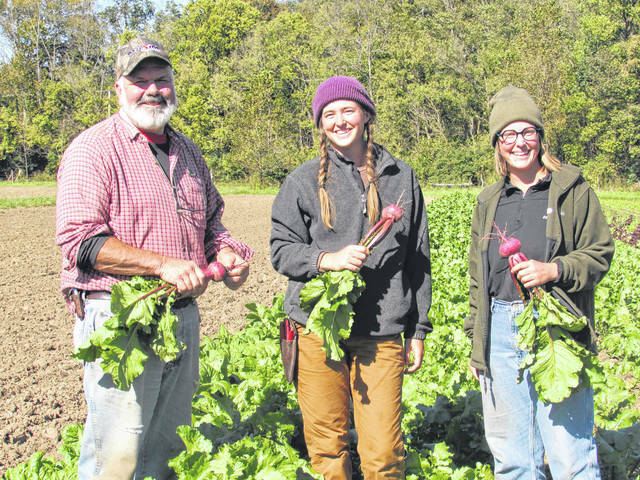 https://www.rurallifetoday.com/wp-content/uploads/sites/56/2018/11/web1_Turnips.jpgLeft to right: Guy Ashmore, Laura Kington and Rachel Metzler with freshly picked turnips at That Guy’s Family Farm. 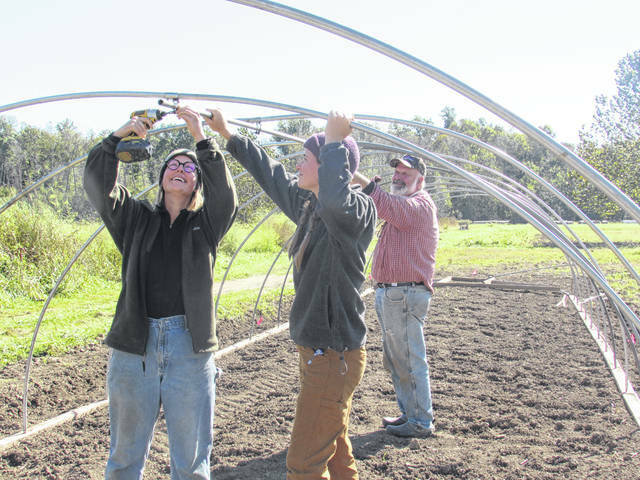 https://www.rurallifetoday.com/wp-content/uploads/sites/56/2018/11/web1_HighTunnel.jpgRachel Metzler (left) and Laura Kington (right) helping Guy Ashmore construct a high tunnel at That Guy’s Family Farm. 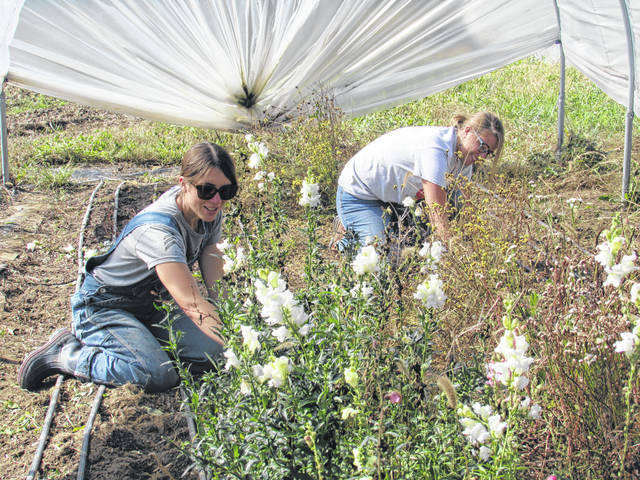 https://www.rurallifetoday.com/wp-content/uploads/sites/56/2018/11/web1_NellieChelsea.jpgNellie Ashmore (left) and Chelsea Gorman (right) of That Girl’s Flowers pulling flowers out of a high tunnel.